When you were young, dressing up meant putting on a cape or a princess dress. Now, it means putting on a nice blazer or finding the perfect tie to make a good impression. College students have many reasons to dress up. From a class presentation, to an important interview – or even to a date – professional attire is probably important. Unfortunately, professional attire is expensive and not in the budget for a college student. That’s where the Career Closet comes into play. The Career Closet is a place on campus where students can get professional clothing for FREE. 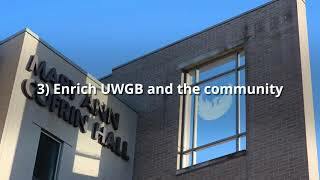 There are two minor rules: First, to receive clothes you must attend UWGB; Second, each student is allowed five pieces of clothing per semester. One piece could be something as little as a belt – or even an entire suit set. Follow these two rules, and you can avoid the mall prices and still look top-notch. All attire in the closet are donations – mostly from community members, UWGB faculty staff and alumni. Students can find suits, dresses, pants, dress shirts, blazers, neckties and skirts. The Career Closet is a fairly new resource on campus. The project was started by Linda Peacock Landrum, Director of Career Services after seeing the need for something like it at UWGB. The Career Closet officially opened in the Spring semester of 2018. According to Danielle Weber and Karla Miller of Career Services, The Career Closet typically sees about 20 students per month utilize this resource. They hope to see more students in the future. Instead of going to the mall every time you need a new outfit, save your bank account and Shop at The Career Closet. The only card you need to swipe is your I.D. The Career Closet is in the Career Services office and open Monday-through-Friday; 8AM-to-4PM. You must provide your student I.D. to receive any clothing or accessories. It’s a great source that students at UWGB don’t know about!